No one can say exactly what it looks like when a planet takes ill, but it probably looks a lot like Earth. Never mind what you've heard about global warming as a slow-motion emergency that would take decades to play out. Suddenly and unexpectedly, the crisis is upon us. It certainly looked that way last week as the atmospheric bomb that was Cyclone Larry--a Category 4 storm with wind bursts that reached 125 m.p.h.--exploded through northeastern Australia. It certainly looked that way last year as curtains of fire and dust turned the skies of Indonesia orange, thanks to drought-fueled blazes sweeping the island nation. It certainly looks that way as sections of ice the size of small states calve from the disintegrating Arctic and Antarctic. And it certainly looks that way as the sodden wreckage of New Orleans continues to molder, while the waters of the Atlantic gather themselves for a new hurricane season just two months away. Disasters have always been with us and surely always will be. But when they hit this hard and come this fast--when the emergency becomes commonplace--something has gone grievously wrong. That something is global warming. The image of Earth as organism--famously dubbed Gaia by environmentalist James Lovelock-- has probably been overworked, but that's not to say the planet can't behave like a living thing, and these days, it's a living thing fighting a fever. From heat waves to storms to floods to fires to massive glacial melts, the global climate seems to be crashing around us. Scientists have been calling this shot for decades. This is precisely what they have been warning would happen if we continued pumping greenhouse gases into the atmosphere, trapping the heat that flows in from the sun and raising global temperatures. Environmentalists and lawmakers spent years shouting at one another about whether the grim forecasts were true, but in the past five years or so, the serious debate has quietly ended. Global warming, even most skeptics have concluded, is the real deal, and human activity has been causing it. If there was any consolation, it was that the glacial pace of nature would give us decades or even centuries to sort out the problem. 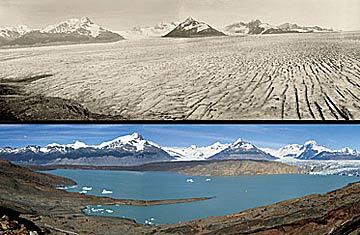 But glaciers, it turns out, can move with surprising speed, and so can nature. What few people reckoned on was that global climate systems are booby-trapped with tipping points and feedback loops, thresholds past which the slow creep of environmental decay gives way to sudden and self-perpetuating collapse. Pump enough CO2 into the sky, and that last part per million of greenhouse gas behaves like the 212th degree Fahrenheit that turns a pot of hot water into a plume of billowing steam. Melt enough Greenland ice, and you reach the point at which you're not simply dripping meltwater into the sea but dumping whole glaciers. By one recent measure, several Greenland ice sheets have doubled their rate of slide, and just last week the journal Science published a study suggesting that by the end of the century, the world could be locked in to an eventual rise in sea levels of as much as 20 ft. Nature, it seems, has finally got a bellyful of us.